Here is the final route that I biked created from a screenshot of my daily GPS files added together by the incredible Adze. My bike ride to Les Gets, Zurich and then the complete length of The Danube River a total of 3000 miles (4800km) or so. Full bike ride each colour is a day. 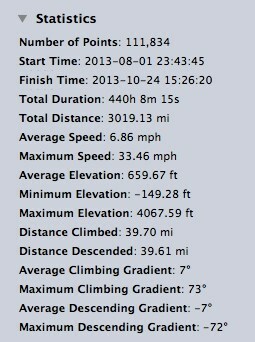 Here are the stats as made by Adze from my gpx traces. Hopefully the above map will be clickable to show on Google Earth .